Prep / Hands on: 45 min. My strudel is out of oven. The ends and bottom of strudel intact but top split in one section. Hardly any evidence of leaked juice. Baked on bottom rack just as I do pie. Is split acceptable? If not, what factor needs changing. Dianne – Grandfather born Vimperk. Hi Dianne, I am sorry to hear that! The top part of strudel had to be too thin. Mine never cracked on top. If it cracks than usually just on the bottom little bit where the dough was too thin and juices leek little from there and ends. I am on FB as Czech Cookbook where you can post any photos. This website design doesn’t allow that feature looks like it. Any suggestions what I could try next time? 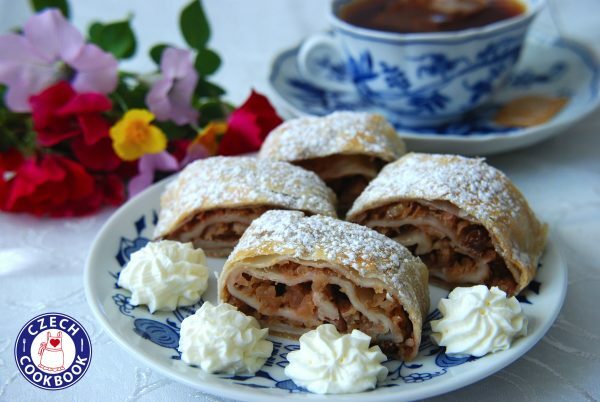 Roll the dough out a little more so it’s thinner or add more apples so the strudel isn’t rolled very tightly? I am sorry to hear that! The dough must have not been rolled thinly enough. It should also be rolled tightly. Some puff pastries are larger so I would add more apples. Wishing you success next time! You can also sprinkle breadcrumbs on the bottom before putting apple mix which will soak up any juices not to make dough soggy. Wishing you success next time! I am glad to hear! When I make it I can’t stop eating it. I sometimes do that too. I add a little coconut to mine.